As Junior Achievement Worldwide celebrates its centennial, we in Armenia rejoice in turning 28 years old. The HSBC Global Initiative, started in 2008 as a three-year US$3.44 million grant, was recently extended to a fourth year, bringing the total funding to just under US$6 million. The extension was the result of the program’s enormous success achieved in the first two years. The Initiative includes global title sponsorship of the JA curriculum known as JA More than Money; a program which is typically targeted at youth ages 7-11. It also provides JA Worldwide with funding for local program implementation by JA operations around the world in selected locations of strategic importance to HSBC Holdings plc (“HSBC”). 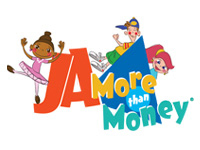 JA More than Money teaches students about earning, spending, sharing, and saving money, and businesses they can start or jobs they can perform to earn money. Six required, after-school, volunteer-led activities. The key learning objectives listed beside each activity state the skills and knowledge students will gain. Students learn to manage a bank account. They play the Community Game to reinforce their money-management skills and to better understand the role and importance of money in their lives. explain the benefits of a personal banking account. practice making sound financial choices. manage a personal bank account by making deposits and withdrawals. or jobs they can perform to earn money. Activities focus on developing a positive work ethic. Students continue playing the Community Game to further understand the role of money in their lives. identify several characteristics of a positive work ethic. distinguish between working for someone and self-employment. identify ways to earn income through jobs or a small business. practice personal money-management skills through business and ethical decision-making. Students identify personal skills and interests and connect them with possible business opportunities. Working in groups, students learn about market research and play the final round of the Community Game. match personal skills with jobs and self-employment. identify three to five ways to share, save, and spend personal income. Students explore their jobs skills and the types of businesses in which they are interested. They identify the basic steps for starting and operating a small business. Using this information, students develop a business plan. define the basic steps in planning and starting a business. calculate operating expenses and income for a small business. develop a basic business plan based on their job skills and interests. Students continue to practice saving and spending as business teams. The concept of making SMART consumer decisions is introduced through role-playing. Students work as teams to play Round One of the Business Game. practice using the SMART system to make consumer decisions. identify the difference between personal and business spending. manage money by making SMART business and consumer decisions. apply the problem-solving steps needed to own and operate a small business. Session Six: What’s the Catch? During the final session, students learn to recognize deceptive advertising and the importance of ethical business practices. Continuing to work as business teams, students conclude the program by playing Round Two of the Business Game. apply money-management skills in a simulated business. record and track financial gains and losses in a simulated business. practice making sound financial choices and using cooperative decision-making skills. apply the steps necessary to own and operate a small business. 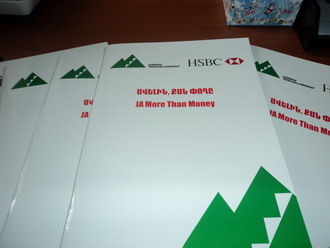 JA More than Money encompasses economics and business curriculum for students in grades three through five. The program emphasizes social studies content while providing a strong focus on mathematics, reading, and writing skills. The JA More than Money experience enhances students’ classroom curriculum. Students are encouraged to use innovative thinking to learn money-management skills that support positive attitudes as they explore and enhance their career aspirations. Through a variety of hands-on activities and technological supplements designed to support differentiated learning styles, students develop a better understanding of the relationship between what they learn at school and their successful participation in a worldwide economy. JA More than Money is a series of six sessions. The program is packaged in a portfolio containing detailed session plans, informative Take-Home Flyers for students and families, and additional learning materials to ensure a successful experience for students, volunteers, after-school staff, and teachers. All JA programs are designed to support the skills and competencies identified by the Partnership for 21st Century Skills. These programs also augment school-based, work-based, and connecting activities for communities with school-to-work initiatives.